Let me start this article by explaining Inbound and Outbound marketing. Outbound marketing, on the other hand, starts with some basic knowledge of your target audience and builds programs to educate those very specific prospects about your products and services in a meaningful way. Outbound marketing examples include: Tradeshows, TV commercials, radio commercials, print advertisements (newspaper ads, magazine ads, flyers, brochures, catalogs, etc. ), cold calls, and email blasts. Gated content is any file, or online material, such as white paper, that is placed behind a prospect capture form. The form may just ask for the user’s name and email address or might demand more details, typically about their jobs and organizations. The form pages are sometimes referred to as information gates, or registration walls. In other words, a user must provide their information to access the content, typically an email address, phone number, or answer few questions. For example, almost all B2B ebooks are gated. Just about every webinar is gated, you have to register to attend it. Even email newsletters are gated content unless their publishers offer an online archive of past newsletters, which most do not. Ungated content includes videos on YouTube and blog posts, and those are available without you having to share any personal information. 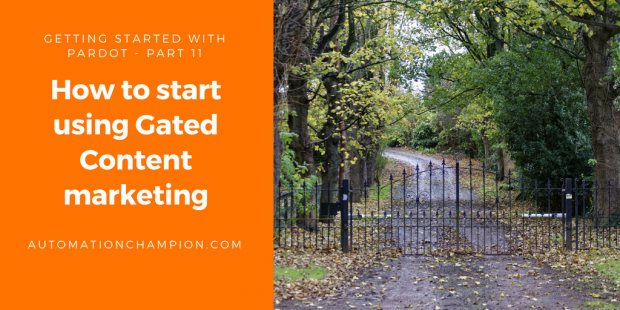 Gated content likely makes up most of the content marketing. The purpose of gated content is prospects generation – acquiring relevant information from potential prospects. Gated content falls under Inbound marketing category. Why should someone use it? Gated content is one of the best ways to capture valuable information about your prospects. Without gated content, visitors on your site may download your content in droves. That, however, may not help your marketing efforts as you will not be able to capture relevant information about your prospects. By following the guidance in my previous blogs – Parts 7, 8 and 9 – David already created a Form to capture prospect data. Now, the Marketing Team at GurukulOnCloud has created a White Paper that they want to host in Pardot and pursue prospect generation – i.e., entice valued prospects to share relevant information. To solve the preceding business requirement we will use the existing form to create gated content; and, upon form completion, we will redirect the prospects to white papers download link. If you want to upload multiple files at once, then click on the + Upload Files button. then choose your file i.e. White paper you would like to upload. You are only allowed to upload less than 50 MB file size. If you want to create Vanity URL then enter the unique path to access this file, i.e MyFirstFile. Remember this vanity URL, as we will be using it again in. moment. Leave the Completion Action section as it is, we will discuss more about it in the upcoming articles. Once you are done, click on the Upload File button, to upload the file on Pardot server. Make sure to enter File URL under Redirect Location field, as shown in the preceding screenshot. Now onwards, when a prospect fills this form, upon completion, he will be redirected to the White Paper URL so he can download the content. –> Pardot will only track non-image file (white papers, data sheets, etc) in prospect activities when a prospect accesses it. –> If you update a file’s content and use a different file name, the URL will change using the new file name. The previous file URL will now point to the new content file. –> When you delete Content files in your Pardot account they will be pushed to the Recycle Bin. They cannot be undeleted — they will be deleted permanently from your instance. In my next blog, I will take a deeper dive by showing you different types of lists in Pardot.